Gives you a Clear Advantage! We recognize that some students are learning Spanish not just because it interests them, but also because they need it for a specific purpose. For this reason, we offer several specialized programs that provide specific vocabulary and coursework that will help you reach your goals and communicate more effectively in the Spanish speaking world. If you require a program focusing on a different field or with different vocabulary, we can modify any program to meet your needs. To make sure we meet all your requests, it is best if you contact us at least 2 weeks prior to your arrival. Our program for specific purposes has the same structure of the Intensive Spanish Program with the specific vocabulary and situation related to your needs. 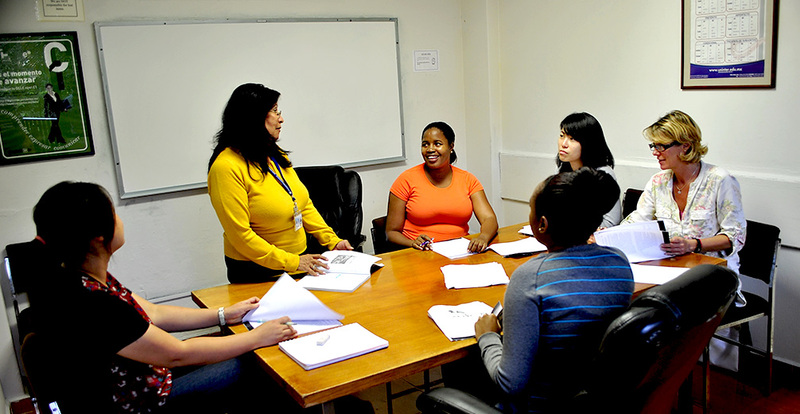 8:00 - 9:00 Spanish Class Intensive Spanish Language Class. Development of Communication, Reading, Writing and Listening Comprehension. 11:15 - 12:00 Lectures for Specific Purposes Croos Cultural Training, Idioms, Interaction with Mexican students about your Profession. 12:10 - 14:00 Class for Specific Purposes Situations, Vocabulary and Conversation for Specific Purposes and Newspaper Analysis. This program is designed for teachers who need to use Spanish as a communicative tool in teaching native Spanish speaking students while at the same time offering them a better understanding of Mexican and Latin American culture. You will work and have discussions with Mexican teachers while improving your level of Spanish fluency. You can also take advantage of one of our internship opportunities depending on your level of Spanish and the length of your stay. We will work with you, practicing techniques and methods specifically designed to meet your goals. This program is designed for health care professionals, or those studying in a health care field who wish to gain a better understanding of the culture and language of Spanish speaking patients, while advancing towards a goal of more effective communication. You can have lectures with health care professionals and professors with knowledge of this field, and also make guided visits or even participate in an internship depending on your level of Spanish and the length of your stay. This program can be modified to meet the needs of doctors, nurses, paramedics, and other health care fields and professions. This program is designed to provide business professionals with Spanish language skills so that they can effectively communicate with their Spanish-speaking colleagues and clients. The proper knowledge of language and culture will expedite beneficial bonds between professionals and their clients and colleagues. Our certified and talented instructors teach vocabulary, practical situations, and cultural aspects related to business. You can also take advantage of one of our internship opportunities depending on the length of your stay and level of Spanish. This program is designed to provide social workers with Spanish language skills so that they can effectively communicate with their Spanish-speaking clients. The proper knowledge of language and culture will establish a functional and beneficial bond between the client and professional. You can also take advantage of an internship or volunteer opportunity depending on the length of your stay and level of Spanish. Our certified and talented instructors teach vocabulary, practical situations and cultural aspects related to the social work field. This program is designed for lawyers who need to use Spanish as a communicative tool, and simultaneously offers a better understanding of Mexican and Latin American culture. Communicating in Spanish, even at a basic level, improves the service offered to Hispanic clients. This course gives the practitioner a basic understanding of the legal framework that their Spanish speaking clients come from. Basic terminology will be taught in the areas of criminal law, domestic relations, and minor civil disputes. There is also an emphasis placed on the practical aspects of language usage.